Pir Hasan Kabiruddin, the son of Pir Sadruddin was generally known as Sayed Hasan Shah, Pir Hasan Shah, Sayed Sadat, Gur Pir Hasan al-Hussain, Makdum Sayed Kabiruddin Shah etc. He is however known in Uchh Sharif as Hasan Dariya. Since his lineage traced back to Imam Jafar Sadik, therefore, he is also known as al-Husayn. He was born in Uchh Sharif in 742/1341 and was the first Indian pir to be born in India. He was edowed from birth with deep spiritual insight and strong common sense combined with sympathy and love for his fellow beings, and was also noted for his piety since childhood. When Pir Sadruddin visited Iran for the second time, Pir Hasan Kabiruddin eagerly desired to join him. Owing to tedious journey, he was not taken to Iran. Being become forlorn, Pir Hasan Kabiruddin started his most famous petition, and prepared a turban for the headgear of Imam Islam Shah. It is known that he also managed to reach Kahek. Islam Shah was rejoiced to see his devotion, and invested him with the mantle of a hujjat, or pir to be effective after his father. The period followed by Pir Satgur Nur was noted as an era of pre-Muslim in Gujrat. The 7th Solanki ruler, Jaysinha Sidhraja (d. 1143) died childless and was succeeded by Kumarapala (1143-1173), a descendant of Karna, the third son of Bhima I, who seized the throne by force. He was succeeded by his nephew, Ajavapala, whose period saw the declination of the Solanki dynasty. His successor Mulraja II was too weak. The next Solanki ruler Bhima II also proved incapable to govern his empire, and the last ruler was Tribuvanpalo, from whom the power was snatched by the Vaghela branch of the Solanki in 1243. The new dynasty produced six kings who were constantly troubled by the Muslim invaders. The last king was Karna, who had been overpowered by Ulugh Khan and Nusrat Khan, the generals of Alauddin Khalji in 697/1298. In 700/1300, Alauddin Khalji appointed Malik Sanjar, surnamed Alp Khan (1297-1317) as a governor of Gujrat and the old Hindu capital Annhilvad became the seat of the governor. Zafar Khan, surnamed Muzaffar Khan (d. 813/1403), one of the trusty nobles of Firuz Khan had been sent from Delhi as the governor of Gujrat in 793/1391. He established an independent Sultanate of Gujrat in 810/1407, and was the first Muslim ruler of Gujrat to suppress Shiism in his domains. His son Tatar Khan, surnamed Muhammad Shah (d. 846/1442) ascended the throne of Gujrat in his father's lifetime. He wanted to capture Delhi, but his father opposed him, thereupon, he imprisoned his father in 803/1403 at Asawal. He ruled for 32 years in Gujrat and twice (816/1414 and 824/1420) made fierce attempt to force the Hindus to adopt Islam. He was succeeded by his son, Ahmad I (d. 846/1442), who brought under his control the whole land of Gujrat and its adjoining territories. He too severely domineered the Ismailis. He was followed by Ghazan Khan, surnamed Tajuddin Sultan Muhammad Shah, but he died soon afterwards. In the meantime, Muhammad Khan bin Nimat Khan, the vizir captured the throne and assumed the title of Alauddin Muhammad Shah. It will be appropriate to infer that during the Muslims occupation of Gujrat and its political turmoil, Pir Sadruddin and Pir Hasan Kabiruddin had exercised strict taqiya during their missionary activities in Gujrat. Pir Hasan Kabiruddin had eighteen sons and one daughter, viz. Sayed Awaliya Ali, Sayed Kasiruddin, Sayed Ali Gohar Nur, Sayed Alam Shah, Sayed Rehmatullah Shah, Sayed Adil Shah, Sayed Jafar Shah, Sayed Israil Tayyar Ghazi, Sayed Shahbaz Ghazi, Sayed Sabe Ali, Sayed Islam Shah, Sayed Imam Shah, Sayed Farman Shah, Sayed Ismail, Sayed Nur Muhammad, Sayed Darwish Ali, Sayed Lal Shah, Sayed Bala Shah Buland Ali, and a daughter Bai Budhai. With the indescribable efforts of Pir Sadruddin and Pir Hasan Kabiruddin, a large proselytism had been resulted in Sind, Punjab, Kutchh, Kathiawar and Gujrat by leaps and bounds during the period of Islam Shah. Sayed Imam Shah admits in his "Janatpuri" (verse, 89) that, "Ismailism promulgated rapidly in India during the time of Imam Islam Shah." The trading class among the Ismaili Khojas gradually began to visit Kahek to see the Imam. Unfortunately, none among the pilgrims had left the historical accounts of the journey. 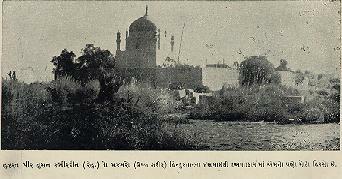 W.Ivanow writes in "Collectanea"(Holland, 1948, p. 54) that, "How precious would have been such an original and unpretentious account of the journey to Persia by an intelligent Khoja traveller of the end of the fifteenth century if it had been preserved in the community." Nevertheless, a manuscript of thirty pages has been discovered in 1977, belonging to a certain Rahim Bhimani (d. 1841) of Ahmadabad. It contains a meagre, rather a historical description of a certain Bhimani family. Rahim Bhimani derived his information from the manuscript of Sheith Jan Muhammad Tharu'ani in 1834. It indicates that a certain Nardas alias Bhimani (d. 824/1420) lived in the time of Dhani Sarcar Nar Islam Shah. He visited Iran with a few Ismailis of Kutchh, and their caravan returned to India via port Hormuz. We are reviewing the period which absolutely suffers with historical documents, and therefore, many prominent characters, professing Ismailism, had not been identified by the historians. Poet Kassim Anwar is worthy of notice to this effect. His name was Ali bin Nasir bin Harun bin Abdul Kassim al-Husayn at-Tabrizi. He was born in 757/1356 in Sarab, near Tabriz. He studied Sufism in his early life, and reported to have embraced Ismaili faith at the age of 40 years, but had to adopt strict taqiya. He lived in Gilan and Khorasan and at last settled in Herat. Kamaluddin Abdur Razzak (1413-1482) writes in "Matla'us Sa'dain wa Majmu'ul Bahrain" that, "In 830/1426, Shah Rukh (1409-1447), the Taymurid ruler, having being stabbed in the mosque of Herat by a certain Ahmad Lur, Kassim Anwar was charged by Mirza Baysunqur with having harboured the intended assassin, and was obliged to leave Herat and repaired to Samarkand. He returned, however, some years later to Khorasan, and took up his abode in Kharjird, a town in the district of Jam, where he died in 835/1431." His Diwan's pieces are composed in Gilani and Turkish. His other works are "Anisu'l Arifin" (Gnostics of familiar) and "Anisu'l Ashiqin" (Lovers' familiar) - both deal mysticism in prose and poetry. W.Ivanow also traced his "Risala dar Duniya wa Akhirat" (Treatise on world and hereafter). Jami (1414-1492) writes in his "Baharistan" (Bombay, 1913, p. 66) that, "Kassim Anwar was a learned philosopher and perfect elocutionist." *	Come to the prayer-hall, purifying yourselves and keep up the traditions of the true religion. *	Why do you miss the heavenly blessings? Do as those believers, who did in the past. *	Only when you swim across the ocean-like world, then alone you will achieve emancipation from this worldly tangels. *	He who duly pays tithe and follow the religion strictly, will never be affected even by fire. *	He is not a faithful who does not lead a life of piety. *	Slander is the root-cause of deficit in agricultural output. *	Get rid of deception of followership and mastership. *	Wake up at midnight to adore God, and keep a fair dealing with the religion. *	One who sleeps (whole night) will cry sorrowfully. *	The root of faith is the path of religion. Imam Islam Shah mostly lived in Kahek, and sometimes in Shahr-i Babak. It is also said that the Ismailis in these villages had built few dens in the upper hills to seek protection during emergency. The period of Islam Shah however passed in peace, and he died in 827/1423. He consigned the office of Imamate to his elder son, Muhammad.